One person was killed on the northbound side of Highway 14 south of the Golden Valley Road off-ramp, April 12, 2019. Austin Dave / The Signal. A man in his 60’s was struck and killed by a motorist Friday, marking the second time in just over a month that a pedestrian has died in a Santa Clarita Valley traffic collision. The most recent victim has been identified by officials at the Los Angeles County Department of Medical Examiner-Coroner, but they are not releasing is name until they speak to his family. “Identification is pending notification of next of kin,” coroner spokeswoman Sarah Ardalani said Monday. And, while investigators with the California Highway Patrol continue to probe the circumstances surrounding the fatal crash, an arrest is not expected to be made. 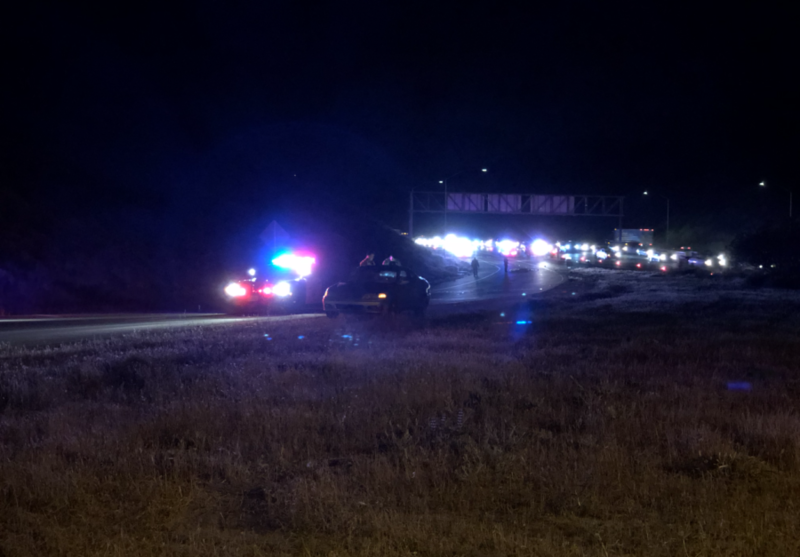 Shortly after 9:15 p.m. Friday, a man was seen walking northbound on the right shoulder of the northbound Highway 14, just south of Golden Valley Road, Investigating Officer Robert Gomez of the CHP wrote in his report. About 20 minutes later, the CHP received calls from more people reporting the same man walking in the slow lane of the highway. About 9:53 p.m., the driver of a 2002 Honda Accord, identified by CHP officers as a 25-year-old Tustin man, was driving northbound on Highway 14, to the Golden Valley Road off-ramp. While the pedestrian was walking in a northwesterly direction within the off-ramp, the Tustin driver took evasive action, according to Gomez, by steering toward the left. The driver was unsuccessful, however, in avoiding the pedestrian, and struck him, Gomez wrote in his report. Paramedics with the Los Angeles County Fire Department arrived at the scene a couple of minutes after 10 p.m., Fire Department Supervisor Art Marrujo said Monday. “This call was for a Honda Accord versus pedestrian,” he said. The pedestrian died at the scene as a result of injuries suffered in the collision. The death marks the second time in less than six weeks that a pedestrian has been struck and killed by a motorist in the SCV. On March 3, shortly after 6:15 p.m., Cecilio Vasquez, 61, of Newhall, was hit by a vehicle on Railroad Avenue at Lyons Avenue. The victim was identified as a 61-year-old homeless man named Cecilio Vasquez, according to investigators with the Los Angeles County Department of Medical Examiner-Coroner. The March fatality happened two days after 62-year-old Teresa Mae Angeli of Newhall was struck by a car while riding her bicycle on Railroad near 15th Street. The investigation into Friday’s crash is ongoing. The slow lane of Highway 14 remained closed for more than three hours while investigators examined the scene. The driver of the Honda was reportedly arrested, not on charges of hitting the pedestrian, but for having outstanding warrants for his arrest, said Daryl Everts, a jailer at the Santa Clarita Valley Sheriff’s Station. Sheriff’s deputies arrived outside Topper Pizza on Magic Mountain Parkway after a pedestrian was struck by a vehicle at approximately 5:41 p.m. on Sunday.